No.3 in the series – ‘A Rising Man’ by Abir Mukherjee meets a submarine crest. This title would have been a tricky one to match but, luckily, the museum has its own rising man. The crest of the 12th Submarine Flotilla features a diver and the Latin motto ‘Resurgam’ – I shall rise again. The Kyles Hydro on Bute became HMS Varbel during WWII , the Headquarters of the 12th Submarine Flotilla dealing with human torpedoes and midget submarines. 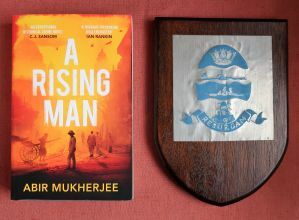 ‘A Rising Man’ was Abir Mukherjee’s brilliant debut novel. He has since added two more to this series, set in India just after WWI, featuring Captain Sam Wyndham and Sgt Surrender-not Banerjee. Abir will be in Rothesay Library on the 3rd and 4th of August.